The grass is green, but the cottonwood trees haven't leafed out yet. On May 26, 2008, the aspen leaves were out at 8000 ft on Mosby Mountain, and wildflowers were blooming. Buck Ridge tops out at about 10000 feet, but its shady paths open up a little later than the more open mountainsides. Here's the Buck Ridge view down into Whiterocks Canyon on June 14, 2008.
excellent post! Makes me a little jealous! I miss high elevations like crazy! Flatland is not my idea, that's for sure! I love all the photos - so much fun! Any elevation above 7,000 feet is too high for my oxygen-loving blood, so immense thanks to you for sharing scenery that I'll likely never get to see in person. Absolutely gorgeous riding trails you have up there on the mountains! Really nice pictures...worth reviewing in the middle of winter. I like the one with you and the horse and dog as well as the wildflowers below it. 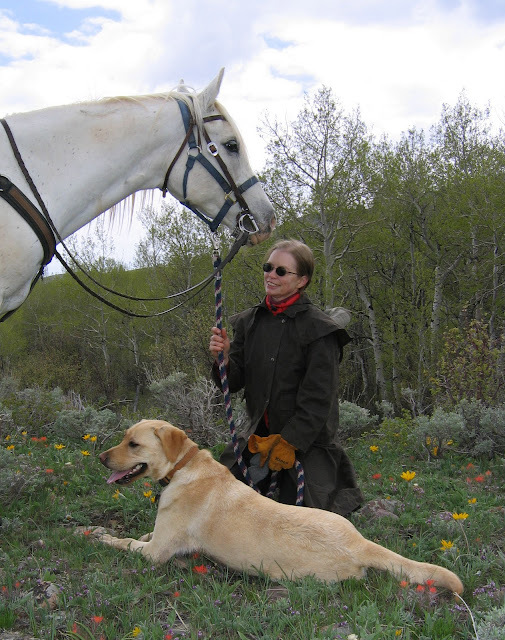 Hi Janie, Looks like you all are getting your plans made for your May and June trail rides. Your pictures were in 2008... Has it been that long since you went on these trails???? Marvelous pictures.... Bet you are waiting NOT so patiently for winter to end!!!!! Johnny, I agree, the high country is the prettiest. C.D., I bet you could get used to altitude if you had time to acclimate. It takes about a month. Ruth, the pic with me, Mischief, Daisy, and the wildflowers is my fav, too. Betsy, we've been on most of these trails every year, but some years we might ride them later in summer or in fall. I just picked photos that matched the time of year to show how the snow was gradually melting in the high country. Yes, we're getting impatient. We may have to go down to southern Utah for a few days to jump start the riding season. Just beautiful! You know I always love the blooms especially. The cactus in bloom are really special! What a great collection of photos, Janie. You can practically spell the fresh air just looking at them. I love that one of you and Mischief and Daisy. Great series of photos. Its obvious what you are thinking about. Oh, such beautiful scenery. I LOVE that photo of you and Daisy in the flowers. So sweet. I couldn't help but notice how alert boss is in these photo's. I'm looking forward to your spring rides too. You certainly have some beautiful rides ahead of you in May and June. The scenery is simply fantastic. I really like that picture of you, Mischief and Daisy. I see you are looking ahead to warmer weather! It must seem like magic when the snow is gone and you can ride the trails again! I bet you all are sooooo excited to hit those trails again and I can see why. You truly live is some pretty country! Spring fever! I've got it too. Can't wait. I love seeing all your rides and I'll bet your dreaming of spring. Saw some light snow leaving the canyon this morning. I bet Daisy, Mischief and Boss can't wait for spring to come either.. its a long winter for then too. The landscape is marvellous and your pictures are a delicious for the eyes.